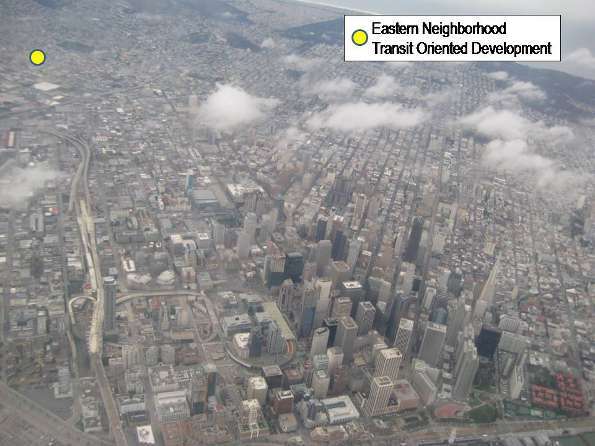 Transit Oriented Development: If Not San Francisco, Where? “The Great Transit Oriented Development Swindle?” reads the headline in the Fog City Journal, one of the growing number of internet newspapers providing serious, professional web-based journalism as an alternative to declining print newspapers (and their often less than effective web sites). The article does not directly answer the question in the headline, but certainly provides enough ammunition to what has become a commonly accepted mantra among planners and urban boosters. It reveals how transit oriented development (TOD) is often based upon fragile foundations that amount to an ideological swindle. It is important to recognize that the Fog City Journal is no right wing or libertarian organ. There is little market for that in the city of San Francisco. The leftish bent of the Fog City Journal, combined with author Marc Salomon’s unusually incisive (and footnoted) analysis makes this article noteworthy. It also seems clear that the author is a proponent of more transit service and funding, not less – even though he is highly skeptical about the current TOD craze. Transit Oriented Development: The idea behind transit oriented development is that, in new, higher density developments, people use transit more and cars less. Transit oriented development has become a first principle of some, who seem to believe that cities can become vibrant in part by strangling new suburbs out of existence. Transit oriented development is at the very heart of the Obama Administration’s “livability agenda,” and is frequently cited admiringly by Secretary of Transportation Ray LaHood. Salomon correctly notes that “San Francisco is not the regional employment center.” In fact, nearly 90% of employment in the San Francisco-San Jose area is not in downtown San Francisco. Indeed, Silicon Valley, not downtown San Francisco, has long been the largest employment center in the area and there are also major job concentrations in the suburban belt east of Oakland. No Better Place for Transit Oriented Development: Yet, there are few places in the world better served by transit than the Eastern Neighborhood transit oriented development. The project is no more than a long walk from downtown San Francisco (Figure 1). Residents will be able to access frequent “Muni” bus services. The development would be well served by BART (the regional metro), midway between two stations, both of which access four routes. There are few places in the world where a non-transfer station serves that many routes. Salomon analyzes transit from the center of the development, the corner of Mission and 20th Streets. Transit Oriented Development: Forcing Longer Commutes: Salomon’s concern starts with the recognition that these systems are already overcrowded. However there is more. Even with their heavy (and highly subsidized) loads, the virtually unparalleled level of transit service available from Mission and 20th cannot compete with the automobile. 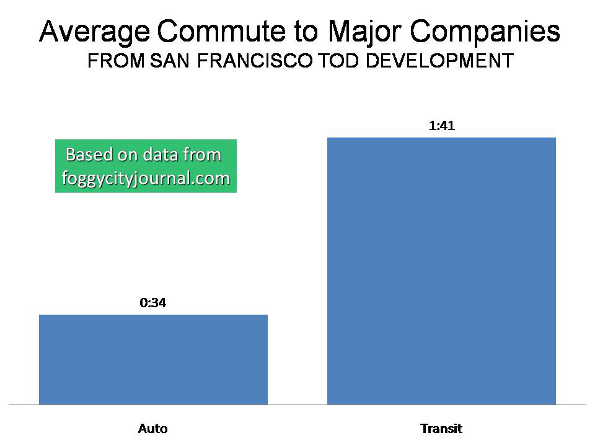 Salomon’s analysis shows that, on average, transit oriented development residents working at jobs at the 30 largest firms in the San Francisco Bay area would spend nearly 3.5 as much time traveling to work by transit than if they drove themselves. The best transit travel time would be more than double the auto travel time, while the worst would near five times (Figure 2). Transit Oriented Development: Making Traffic Congestion Worse: Mirroring the research on the association between higher densities and greater traffic congestion, Salomon suggests that without substantial additional transit spending, transit oriented development “in San Francisco will most likely diminish transit reliability by increasing auto trips–the precise opposite of transit oriented development’s stated goals.” On this point, however, it is well to remember that no transit system has ever been seriously conceived, much less proposed or implemented that could provide competitive mobility between Mission and 20th and the dispersed employment throughout the San Francisco Bay Area. A transit system that reaches all of the dispersed employment in a modern American or European urban area at travel times competitive with the car could require annual expenditures that approach or even exceed the gross domestic product of the area. Unlike most urban advocates and the Secretary of Transportation, it is apparent that Salomon understands the first principle of “livability.” Livability requires affordability. In San Francisco suburb of Brentwood, for example, Salomon notes that the median house price is $298,000. Brentwood is located in eastern Contra Costa County, approximately 50 miles from downtown San Francisco. But there is no need to travel that far, since there is an abundance of jobs much closer. This compares to a median price of $627,000 for an apartment/condominium near the proposed transit oriented development in San Francisco. Further, the house in Brentwood will be more than double the size of condo in the transit oriented development, as data from zillow.com indicates. 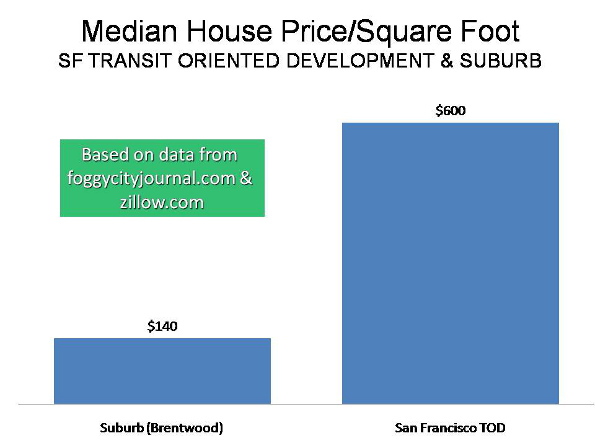 Thus, the new home buyer will pay less than one-fourth the cost per square foot in Brentwood compared to the transit oriented development (Figure 3). The Brentwood household will also enjoy a backyard that would not come with a 23rd floor flat. Lifestyles of the Few: None of this is to suggest that transit oriented development cannot be attractive. The mistake, however, is the outsized enthusiasm of its proponents. Like a Mini Cooper or sportscar, transit oriented development serves the needs and wants of a narrow niche market, but by no means anything close to the majority. In order for transit oriented development to check sprawl, prospective home buyers would be expected to make the choice between purchasing a $300K unit in Brentwood or a unit costing twice that much in San Francisco. Further, in order to check motor vehicle commutes, the assumption would be that someone paying that urban location premium would more than double their commute time by taking transit. Simply stated, many of the claims of transit oriented development proponents simply do not “pencil out.” TOD residents will have to drive, unless their jobs are within walking distance. Further, in the dynamic economy that has developed in US urban areas, few can assume that they will always work in the same place. Most importantly, however, very few suburbanites could afford the tony TODs. That’s not a problem, however, since most of them are probably not sorely tempted. Submitted by towxa1122 on Mon, 09/08/2014 - 09:54. Submitted by sl786982 on Sat, 09/28/2013 - 06:38. Submitted by robert1122 on Thu, 08/29/2013 - 06:06. Submitted by zacharyhenry54 on Thu, 09/12/2013 - 23:52. Submitted by tslrm on Thu, 06/05/2014 - 05:15. Submitted by zion1122 on Wed, 08/28/2013 - 01:53.
density is more expensive because that's what people want! Submitted by Jay on Sat, 03/13/2010 - 12:02. Wendell, you rightly comment that real estate in downtown San Francisco is 4x more expensive than in Brentwood. However, you don't identify the obvious supply/demand message: SF is more expensive because PEOPLE LIKE DENSITY, they like transit options, they like being able to walk from their house to a deli. The reason Brentwood is cheaper, is because people don't value space as much as they do convenience, culture, and transit options. Brentwood is cheap because it's a "last resort" option. Simple analogy: Mercedes are more expensive than Fords. Wendell, you always argue that because of this fact, we shouldn't waste our money buying Mercedes. I believe that we should manufacture more Mercedes, to bring down their cost. The solution is to build more places like SF, with density and transit options. That's what the free-market is telling us, and for someone as free-market focused as yourself, you always seem blind to this. Submitted by doesurmindglow on Sun, 03/14/2010 - 04:33. Note how Cox compares "price per square foot" to back up an argument about affordability. Has he considered that people may be paying for things other than square footage? You can't make this argument with only square footage in the denominator. You simply must consider the other factors. Otherwise, why build cities at all? Submitted by arlington on Fri, 03/12/2010 - 10:51. Most TOD developments are just chain-filled malls with no roof, a parking garage instead of a surface lot, and self-important architects circle jerking each other for re-creating Disneyland instead of re-creating Levittown. In DC, the key to neighborhood development has been community financing of local merchants, and many of the funds have improved areas that are nowhere near Metro stops, including Logan Circle, Adams-Morgan, and H Street NE. TOD is almost always financed by BofA, Wells Fargo, or some national bank with no clue about the local community. And it forces up rents to the point that community financing is not economically viable. We don't need anymore Panera Bread-Starbucks-condo-filled developments near train stations. Submitted by marcos on Fri, 03/12/2010 - 10:40. Where to start? Thanks for your supportive comments. But please do not mistake criticism of SF's developer-friendly TOD for any support of developer-friendly suburban sprawl. The reason why I wrote the piece in the FogCityJournal.com was because I was disgusted at the herd mentality of local environmentalists and poverty pimp nonprofits behind the pied piper of local developer lobbyists singing the praises of TOD in SF. I fear for my own safety should the vicious cycle of denser housing bringing in more cars, slowing down already disinvested and unreliable transit, making it less attractive, driving more folks into their cars, all of which puts me in greater bodily danger as a cyclist in San Francisco. Some might want the suburban lifestyle (I want gold bricks on my doorstep, but alas). The state, federal and locally subsidized costs of sustaining that land use and transportation pattern are enormous and those costs end up socialized onto the rest of us. The cities generate money, they don't cost money like the 'burbs do. The political economy of state and local land use policy is as corrupt as it gets because land use is the only local operation that can generate the kinds of profits that can buy elections. And you can't really offshore it. This phenomenon is expressed in both patterns. The only difference is that SF's TOD's impacts are merely infrastructural and local while the impacts of sprawl are much more significant and further ranging as is sprawl's subsidy. For a variety of reasons, odds are that we in the US will soon have to pay more for scarce imports like oil with hard currency or its equivalent. Barring some unforeseen breakthrough in energy technology, the suburbs' oil dependent days of sprawl are numbered, as the full spectrum energy footprint of dispersed sprawl is outlandishly expensive if not subsidized by the cities with sprawl welfare transfers. The economic and land use patterns of the unique economic period when the suburbs arose, after WWII, are not viable in the emerging politics and economics. The fact is that the levels of consumption that led to a certain quality of life that most of us middle class white folks came to know in the late 20th century was not normative and only resulted from certain political and economic conditions unique to that time which no longer exist and may never exist again. There are many other metrics for quality of life than the tract home and possessions: such as health, good food, retirement, education, transportation security, a healthy ecology, reliable fulfilling employment and free time. Indeed, collective sublimation of anxiety over future insecurity into housing, a financed commodity, is part of what crashed the economy and diminished the quality of life of tens of millions of Americans. There are no easy answers to such questions, no one-size fits-all pills we can pop to make everything okay. We do know that since Reagan, we've about doubled the population and cut the number of good jobs in half while waging a war on the public sector. We'll see how that suburban public sector holds up as it contracts and how attractive sprawl really is when it loses its entitlements has to pay some of its own heftier freight with fewer resources. The NYC subway adds a measurable increment to the City's economic productivity, saw the stat years ago but cannot locate it to confirm the number. Robust transit is a long term investment for the collective benefit, both individual and corporate. This is not rocket science and was solved a century ago. Increased traffic due to development and growth need not be a hit on quality of life if there is an underground option to avoid it. There are plenty of resources in the economy to pay for these infrastructure systems at the same level with which sprawl is subsidized. Military funding used to secure cheap energy that subsidizes the burbs would be a good place to find those resources. The impediments to doing so are political more so than economic. Both TOD in SF under these conditions and sprawl regionally are policies where the sales job cannot stand up to casual scrutiny, where the subsidies run counter to expressed public policy. The sooner we get rid of the players writing the land use laws to put money in their bank accounts, the sooner we'll see land use policies that reflect the broader general interest. Perhaps then we'll figure out how to build housing without some people getting paid off with a lot of money and the rest of us covering their costs for free and ending up with housing that does more harm to existing residents than good.